Voice over Internet Protocol. Technology that allows you to transmit voice calls as digital data packets through IP networks rather than use the traditional method that sends analog signals sent along the Public Switched Telephone Network (PSTN). Placing a VoIP call can be performed with a regular phone, special IP phones, or mobile devices. See the Top 10 Reasons to Switch to VoIP for even more benefits as well as factors to consider when thinking about moving to a VoIP system. What are the benefits of choosing Jive as my VoIP provider? 1. You’ll have access to hundreds of advanced features, all of which are included in the monthly per-seat charge. 2. 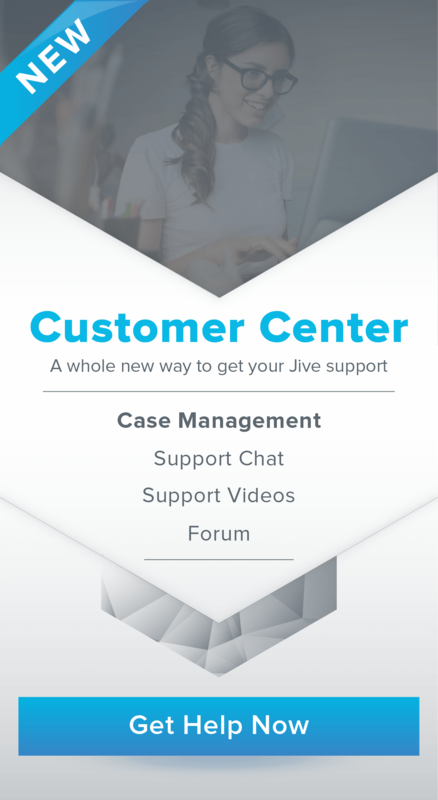 Jive’s world class Customer Support is ranked #1 in the industry. We’re always here to help you whenever you need assistance – 24/7, 365 days a year. 3. Jive is well known for its world class, user friendly online portal. Jive customers no longer need to rely on IT experts to help setup and manage their telephone systems. Changes are easy to make in your online portal which you can access in your office or on the go. See the 10 Reasons Companies Are Switching to Jive for even more benefits to switch to Jive. Can I use my current phone number with Jive? Yes! See our number transfer checklist to learn everything you need to know about getting your number over to Jive. Will my current phone work with Jive? Please see our phone guides for a complete list of phones that Jive supports. Go to jive.com/phones for a list of phones that you can purchase directly from Jive. Can I purchase a phone from Jive? Yes! Go to jive.com/phones for a list of phones that you can purchase directly from Jive. Contact Sales at 877-548-3003 with any questions or to place your order. There are so many models of routers or firewalls on the market that it is almost impossible for us to know with certainty if your existing hardware will work. Our list of recommended and blacklisted routers is a good place to start to determine router compatibility. Can I purchase a router from Jive? Yes! Contact Sales at 877-548-3003 and to get help selecting the best router for your needs. See our router recommendations for additional assistance. What are the network requirements for using Jive? See our network requirements to make sure your network is ready for Jive. Does Jive support 911 calls? Yes! See our 911 and Service Availability Policy for more information regarding E911. How do I improve the audio quality of my calls? Call audio quality is almost entirely dependent upon the stability of your internet connection from your internet service provider (ISP). While Jive can help diagnose connection stability issues, only your ISP can resolve these issues for you. Jive recommends assigning IP addresses via Dynamic Host Configuration Protocol (DHCP) and using 8.8.8.8 and 8.8.4.4 as DNS servers. Allow phones unadulterated access to/from Jive IP blocks. Increase UDP timeouts to 300 seconds. Disable SIP ALG when applicable. Enable Consistent / Persistent NAT when applicable. How do I access my PBX (online portal)? 4. From the Services section, click your PBX. How do I direct a phone number? 1. Click Phone Numbers in the left sidebar. 2. Click the phone number that needs to be directed. 3. From the General tab > Behavior section, choose Extension and then browse for and select the desired destination. 1. Dial *99 from your Jive phone (or *98 from another Jive phone). How do I set up the Auto Attendant in my Dial Plan? An auto attendant plays a recorded sound clip providing dialable options to callers. Based on the option chosen, the caller will be routed to different call paths. See Set Up an Auto Attendant to learn how to do this. Before setting up your auto attendant, we recommend that you understand the content found in Dial Plans Overview and Create a New Dial Plan. Note: In order to record sound clips, you must have prompt recording permissions given to you by a super admin. There are a number of potential reasons why a phone is not working. Complete the following steps in order to identify and correct the issue. 1. Verify the phone is plugged in correctly. 2. Power cycle the phone. 3. Verify the phone has an IP Address. Note: This is found your phone’s menu options. 4. Verify the phone has an assigned user. 5. Verify the phone has an assigned line. 6. Verify the phone MAC Address was entered correctly in the portal. 7. Verify the phone can retrieve its configuration. Contact us for more assistance and we would be happy to help. Can I record my phone calls? Yes! All Jive customers can record all or some of the calls to and from your account. System admins can allow PBX-wide recording, or set up recording on specific phone numbers and extensions. Jive is integrated with Amazon S3 for cloud storage so you can access your call recordings from virtually anywhere. Before you can record calls, you will need to set up your Amazon S3 storage account. For payment and billing questions call 801-980-1838.